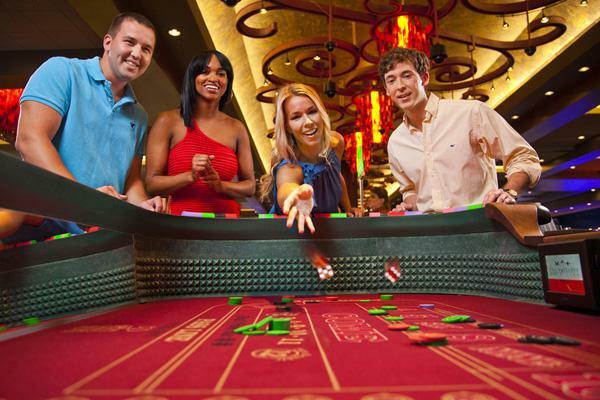 One of the most exciting game in the casino, Craps involves two dice on a table designed for the game. Don’t think that it’s a simple numbers game because it’s that and much, much more. A craps table has room for twenty players, but not all of them have to roll, or shoot, the dice. In fact, to start a game, only one person needs to make a bet before the dice are rolled and the action begins. There are two phases in each round of play. In the first the shooter makes one or more “Come Out” rolls to start the game. This is after the betters have placed bets in the Pass Line or the Don’t Pass Line. If the shooter rolls a 2, 3 or 12, the shooter has “Craps” and bets on the Pall Line are lost. If the shooter rolls a 7 or 11, it’s called a Natural and the Pass Line bets are deemed winners. Once the shooter rolls a 4, 5, 6, 8, 9 or 10, the number is called the Point and the Stickman (the casino employee in charge of the game table) will move an On button or marker to the number and the game moves to the next point. In the “Point” phase, the shooter rolls again. If he rolls the point number, the bets on the Pass Line win. If the shooter instead rolls a seven, it’s called a Seven-out and the bets on the Pass Line lose and the round is complete. If the shooter doesn’t make Point or if he rolls a seven, the round is over and the dice are passed to the next person around the table. If the shooter does make Point, he starts another round with a Come Out roll to start the cycle again.